A Midwest city considers an affordable option to house more families in walkable neighborhoods. 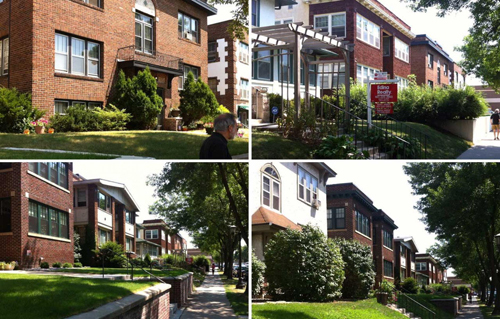 To relieve a worsening shortage of housing, Minneapolis planners have suggested allowing the construction of four-unit apartment buildings in nearly all neighborhoods, the Minneapolis Star-Tribune reports. The proposal to ease zoning restrictions on single-family neighborhoods would help fulfill campaign promises of Mayor Jacob Frey and Council President Lisa Bender to increase housing supply to accommodate a growing population, notes the paper. Allowing four-unit apartments throughout the city is an interesting affordability strategy. These buildings can easily fit into single-family neighborhoods yet offer four times the density per lot. The cost of construction is similar per square foot to wood-frame single-family houses, and such buildings can be constructed incrementally by small builders and developers. With 413,000 people, Minneapolis, Minnesota, has been growing at a strong pace this decade—gaining 8.1 percent population from 2010 to 2016. This growth has put pressure on housing prices and rents. Minneapolis is amply supplied with alley-loaded single-family neighborhoods—most of the city is zoned for single homes or duplexes, notes the Star-Tribune.